These Farm Heroes level 432 cheats and tips will help you beat level 432 of Farm Heroes. 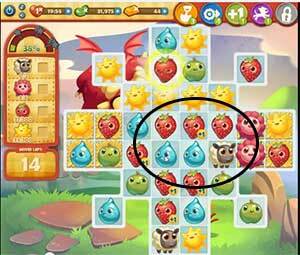 The objective of Farm Heroes level 432 is to reach 100% growth in 22 moves by collecting 22 sheep, 6 flowers, 100 strawberries, and 100 suns. 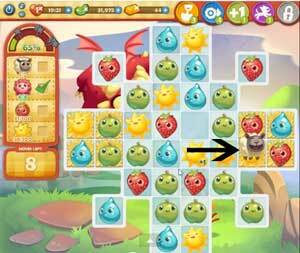 Your first priority in Farm Heroes Saga level 432 is to make the flowers bloom. 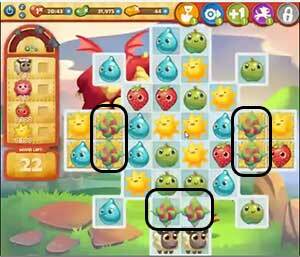 There are a total of six flowers in this level and they are all blocking important areas of the board. The board is oddly shaped and there are protruding edges that contain valuable assets that need are essential to beating this level. These protruding edges contain 4 hay squares and the 2 sheep that you need to collect. The problem is that they are being blocked by flower buds and cannot be accessed until the flowers bloom and get collected. To make the flowers bloom and free the sheep and hay squares, you need to make matches adjacent to the flower buds a total of 3 time to make them fully bloom. When you are making the flowers bloom, you want to make matches with your required cropsies. This will be killing three birds with one stone because you will be collecting required cropsies, making the flowers bloom, and freeing the sheep and hay all at the same time! Once you collect all of the flowers, you should be focusing on getting the two sheep to the hay squares. You should be moving the sheep this way, but red strawberries and yellow suns if possible. Once the sheep are safely in their hay squares, you can treat this level like any other normal level and collect the rest of your quota. Once the flowers are gone, you can bring the shepp up and into the hay. You’ll have to herd both sheep up separately, but try to bring them both up into the middle of the board. You can then easily push both of them into the hay at once.